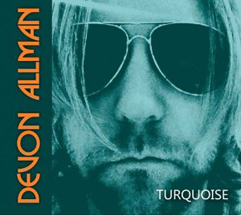 Devon Allman’s first solo release Devon Allman – Turquoise, released on the Ruf Records label, features Blues, Latin Rhythms, Country Rock, and Devon’s bluesy vocals with heartfelt lyrics and tight arrangements. The release contains 10 original tracks that will keep you captivated throughout. Devon Allman - Turquoise was produced by Multi-Grammy Winner Jim Gaines and was released on the Ruf Records label. This marks Devon’s first solo release and his fourth overall counting two releases with his band Honeytribe, and one with his band Royal Southern Brotherhood. Turquoise contains 10 original tracks written by Devon Allman and one cover track. This is a gritty straight ahead soulful release that allows Devon to step out from his bands, Honeytribe and Royal Southern Brotherhood, and show his chops. Don’t Set Me Free, co-written with Mike Zito, opens with a raw guitar riff that sets the mode for an emotive song where Devon sings, “I only wanted you with me, Don’t set me free…I hear your footsteps down the hallway, now you’re walking on down the street…and you don’t give a damn about me.” The melody is edgy and translates nicely to the emotional tone of the song. Devon likes to include a cover of one of his favorite artists on his releases, and on Turquoise he covers Tom Petty’s Stop Draggin My Heart Around. Alongside his special guest Samantha Fish, the two lay down a striking cover, move over Tom and Stevie. The acoustic track Yadira’s Lullaby is a poignant arrangement with great guitar work that sums up an excited, quiet, passionate, and diverse Devon Allman. Other great tracks include Homesick, a blues track that digs into the road weary performer, Into the Darkness, a track written when his son was born, “Take my hand and walk into the darkness,… promise me you will never back down no matter how hard it gets,” Key Lime Pie, a track written from every man’s weakness, his stomach, he loves his Cuban girlfriend’s Key Lime Pie, and the release closes with the track, Turn Off The World, one of those songs that comes from nowhere and at the most unlikely times, but it seals this powerful release with an exclamation point. Follow Luxury Experience on Facebook at: www.Facebook.com/LuxuryExperience.com. Websites where you can procure Devon Allman - Turquoise are Amazon, Ruf Records, and iTunes. © March 2013. Luxury Experience. www.LuxuryExperience.com. All rights reserved.